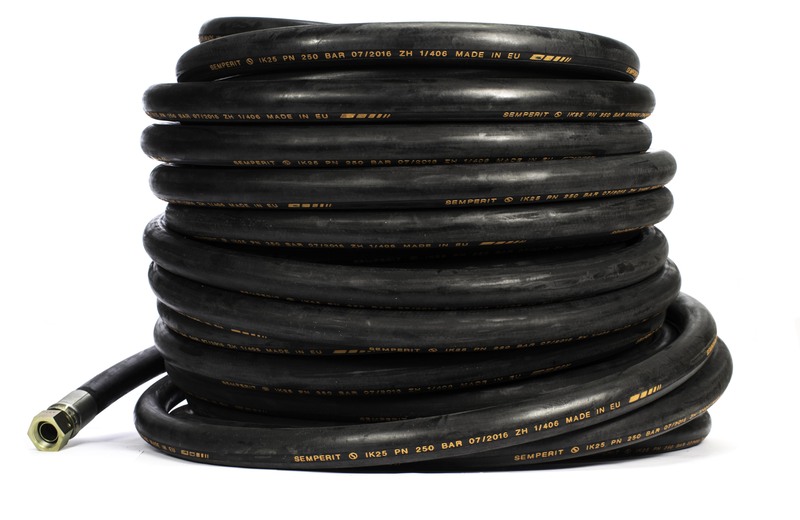 Pressure hose suited for sewer cleaning vehicles, for flushing drains and sewers in industry, commerce and infrastructure. Feature: Very cost effective due to its highly abrasion and weather resistant cover. (Abrasion according to EN ISO 6945:2000, max 0.5g (100N)). The smooth cover provides a low friction coefficient and is easily cleaned. Notice: Other connections on request. Every assembly has a unique serial number on the coupling which, refers to the accompanying test certificate. High quality standards ensure maximum safety (each hose is pressure tested and the bore size is continuously checked electronically). Cover: NR/BR, black, smooth, highly abrasion resistant, weather resistant. Marking: Continuous labelling, orange: “SEMPERIT S IK 25 PN 250 bar month/year ZH 1/406”.